The National Parks on the Air (NPOTA) is off and running. Making contact with a handful of stations currently operating from NPOTA locations has made me wonder if the ARRL has had a good idea with NPOTA as a way to help celebrate the anniversary of the National Park Service. I am a huge fan of both the National Parks and the National Park Service. Anyone who is interested in the history of our National Parks would be well rewarded to start with the Ken Burns documentary The National Parks: America’s Best Idea. Yellowstone generally gets credit for being the first National Park back in 1872. However, the National Park Service was not established until 1916. That period in between provides us a very good reason that there are times when we need a government organization to protect us from ourselves. During that in between period, the Army was given the mission of attempting to protect both Yellowstone and Yosemite. Like most missions the Army received, they were underfunded, under equipped, and undermanned. They did, however, do the best they could to protect these amazing areas. Many Americans saw these new National Parks as areas for economic exploitation. If it wasn’t for many individuals working long and hard for the establishment of the National Park Service, it is very likely we would not be able to enjoy the parks we have today. Stephen Mather and Horace Albright were the two primary individuals who secured the establishment of the National Park Service. Ken Burns talks about these two individuals in his documentary and there are also a few books that do a great job telling the story (Creating the National Park Service: The Missing Years and The Birth of the National Park Service: The Founding Years, 1913-33). Yosemite: President Theodore Roosevelt, left, poses with John Muir for pictures on Overhanging Rock at the top of Glacier Point, near which the men camped in a hollow and awoke to five inches of snow in 1903. The National Parks exist for our enjoyment. Generally that enjoyment manifests itself in some type of hiking, camping, fishing, watching for wildlife, or learning about history. This interaction between Park and citizen can be passionate, emotional, revitalizing, inspirational, and an educational experience. With all that being said, I was a bit surprised to hear stations making contacts for NPOTA locations like it was a contest. Each NPOTA location is identified by a letter-number combination. No discussion of where they actually were. No description, no discussion. It is a bit sad to see there is a Leader Board – which only facilitates looking at NPOTA as a contest rather than an actual celebration. I also wonder how these activations are impacting those non-amateur radio enthusiasts who are visiting a NPOTA site. Is this putting amateur radio in the best light? Are these NPOTA activations promoting the National Park Service or showcasing Amateur Radio to the public? What would Stephen Mather and Horace Albright think about NPOTA? It will be interesting to see how NPOTA progresses over the coming weeks and months. Author shedbergPosted on January 4, 2016 Categories army, history, radioTags books, contests, national park, NPOTA, special event station, Yellowstone, Yosemite3 Comments on NPOTA: ARRL’s Best Idea? Last week was busy – I spent the whole time down in Seoul attending meeting after meeting with my evenings spent on a bunk bed in a communal room (trying to save a little cash for Uncle Sam). The week was productive, but tiring. The main US military garrison in Seoul, Yongsan, has a lot of amenities that you will not find up at my camp. I got to enjoy many of the various restaurants located there as well as venturing off into Seoul itself, located just outside the gates. Two key finds in Seoul: a restaurant that serves American Chinese food and an Irish pub that serves Guinness from the tap. I enjoy Korean food quite a bit, but also like a variety. Most people know that Chinese food in the US does not come close to resembling the actual cuisine of China… and I have no problem with that. Serve me up some Orange Chicken or General Tsao and I am a happy man. Top it off with a fresh pint of Guinness… now you’re talking. However, by Saturday morning I was still tired and unmotivated to put up my Buddipole… despite the lure of the 10M contest. I did have a QSO with my dad via EchoLink. He used an app on his Android cell phone and connected through my EchoIRLP node (EchoLink Node #496698 and IRLP Node #3370). My friend brought by some freshly made Hotteok. These pancakes are delicious and I enjoyed them while they were still hot with some coffee. Still wasn’t motivated to put up the Buddipole. Sunday – the Buddipole went up. A 10M dipole with the Buddipole consists of only the 9.5ft whips on either side of the VersaTee. 10M was not really cooperating. In all I had only nine contacts: Australia, Malaysia, The Philippines, and Guam. Surprisingly, I only heard one JA and he couldn’t hear me. No stations from Asiatic Russia either. After sunset, I switched the antenna from a 10M dipole to a 40M vertical. I thought I might look for some JA stations to practice my CW. I have yet to understand how the JA’s use 40M. The JAs can use phone down to 7.030 MHz. This compacts the CW to between 7.000 and 7.030 MHz. PSK-31 is suppose to be around 7.038, but I have never seen any PSK-31 traffic on 40M over here. I must be looking in the wrong place. Shortwave stations still come in at 7.100 MHz and above. So after sunset, all the 40M action is wedged between 7.000 and 7.100 MHz. So far I have not found any one band location where the QRS folks hang out (like the old Novice band in the US). Maybe with a bit more listening I can crack the code on how the JAs manage 40M. As for the HLs… I’ve only heard two on the air. Where are all the HLs? Here’s the good news… cue Bing Crosby… I am heading back to Kansas for leave this coming Friday! Christmas at home with the XYL and harmonics!! I spent Saturday filling out QSL cards, stuffing them in envelopes, and putting on $0.98 worth of postage for the USPS first class international air mail rate. To make life easier I ran both the return envelopes and main envelopes through the printer to get my address on. It would be easier to get some kind of mailing label sheets, which I think I will try to find when I get home for Christmas. Any way you slice it, filling out QSL cards and getting them in the mail takes a while. Keeping me entertained during the QSL card envelope stuffing session was the Insomniac Net through my IRLP node. I am continually surprised by my ability to work stations in South America. I’m not sure what path I am getting the propagation from. There is no one single time of day for my South American contacts – some are in the morning, others in the afternoon. Today was the first day using my MicroHam USB III. The device is small, just larger than a pack of cards. The radio cable, which comes with the interface, is very well shielded. I used the USB III for both CW and PSK – the device worked well in both modes. Is the MicroHam USB III better than the West Mountain Radio USB PnP RIGBlaster? From a performance standpoint, I think it does a better. With PSK streams, I was able to detect and have QSOs with much weaker signals using the USB III. The fact that the USB III has its own soundcard is a big plus. 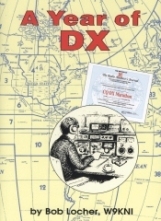 Almost done reading A Year of DX by Bob Locher, W9KNI. Bob details his year-long run in the CQ DX Marathon. The reader gets to sit side-by-side with Bob as he uses his Elecraft K3 and DX cluster alarm to work country after country. Bob demonstrates the importance of researching the various rare entities, determining when they might become active and how best to work them. The book is divided month by month, detailing the QSO with each new entity. Between the month chapters are useful chapters concerned with amplifiers, SSB phone techniques, and an amusing Walter Mitty-esque short story themed around DX contacts. I’m enjoying the book and recommend it (…potential stocking stuffer!). Spinning & Grinning has been quiet for too long. Life here in Korea has been really quite busy. But I can’t complain about the commute, with my quarters only a short three minute hike to the bunker where I work. I don’t go off the camp here nearly as much as I should. By the time I get to my room after work, I am usually just too tired to make the effort. Summers in Korea are HOT. Not Iraq hot, but more of a Georgia heat… with all the humidity. I don’t have a car here, so all my movement is on foot and using public transit. The summer made it fairly uncomfortable to go out and explore. Now the summer is gone and the weather is just right, in my opinion. My quarters here in Korea are not conducive for amateur radio operations. There are low-lying power lines everywhere and not many trees. It is also impossible to establish a permanent feedline exiting my room as there is no existing access and I can’t drill a hole through the wall without incurring the wrath of the garrison commander. The answer: the Buddipole. I’ve read NE1RD’s blog on his 100lbs DXpedition and am well acquainted with the virtues of the Buddipole. With a Buddipole, I would be able to quickly set up and take down an antenna that would let me get on the HF bands. For a feedline, I would be able to support a short run out of my window and out to the Buddipole that would have to be located nearby. Coinciding with the CQ WW DX Contest, I decided to set up the Buddipole and give it a try. I’ve used Hamstick dipoles before without much success. I didn’t have high hopes for the Buddipole, simply for the fact that it is a compromise antenna and I had it set up right next to a three story building. I should have had much more confidence. When I fired up the rig, 20M was alive with activity and I had a 1:1.0 SWR. It was a great feeling to be behind the mike again and I enjoyed logging the contacts. Now I need to go get some QSL cards printed up for HL2/AD7MI. When I learned Morse Code, I learned just enough to pass the 5wpm exam. My approach back then has not set me up for success with CW now. I can function at the 5wpm level, but I really want to do better. I am trying to shed myself of some bad habits… counting dits and dahs or thinking “A Light is Lit” for “L” or “Kiss a Ewe” for “U”…. don’t get me started on “Dog Did It”. Starting from ground zero I am trying the Koch Method. There is a Linux program called Aldo that works well and I just discovered a website called Learn CW Online. Learn CW Online does a great job of tracking your progress and keeping you motivated. With Koch, you start fast and stay fast. My goal is to try and work exclusively CW for Field Day 2009. To prep I can take advantage of the ARRL code practice and upcoming contests. Contesting… the thrill of victory! I posted this picture last year – but as we are in the midst of football (and contest) season again, I thought it would do some good to post it again. While gathering before the upcoming football game, a group of ladies from the ASU Sun Devil Dance Team stopped by to watch W7ASU operate in the 2004 Collegiate QSO Party. No doubt impressed by our smooth (contest) operating techniques, we expect these ladies will be licensed in the near future. We just can’t wait until they join our club! note the expression on the face of KD7LGH – you can tell he is enjoying the contest! Author shedbergPosted on September 5, 2007 Categories radioTags contests1 Comment on Chicks dig amateur radio! Christmas was good to me. I received a NorCal 40A kit along with David B. Rutledge’s The Electronics of Radio. Together these items make up a basic analog electronics’s course and my hope is to build the kit and learn more about electronics and radio. Notes from the budding brewmaster: The final bottles of my first batch of beer were actually quite good. It worked out to the following: 2 weeks in the keg, 2 weeks in the bottle, 3 days in the fridge. Very tasty. Also – I’m sticking to regular white sugar for the carbonation. I’ve also been spending way to much time playing Age of Empires III on my laptop. I need to get in the radio room, tidy up, catch up on logging in a stack of QSL cards, and prepare for Straight Key Night.